The Topeka Hayden Wildcats are well aware of which team is the favorite. Bishop Miege has been the No. 1 ranked team all season and are pegged by many to be one of the best teams in Kansas regardless of classification. Hayden (11-1) and Miege (12-0) will face off for the Class 4A Division I state championship at 1 p.m. Saturday at the Hummer Sports Complex in Topeka. “When you look at it, Bishop Miege has been picked No. 1 all year long,” Hayden coach Bill Arnold said. “They ‘ve been talked about as one of the best teams in the entire state no matter what division it is. They’ve got Division I commitments. I don’t know how you couldn’t look at it as coming in as the underdog. I think our kids will just give it their best and go from there. The Stags went 6-0 in an Eastern Kansas League that is full of quality 5A and 6A schools. 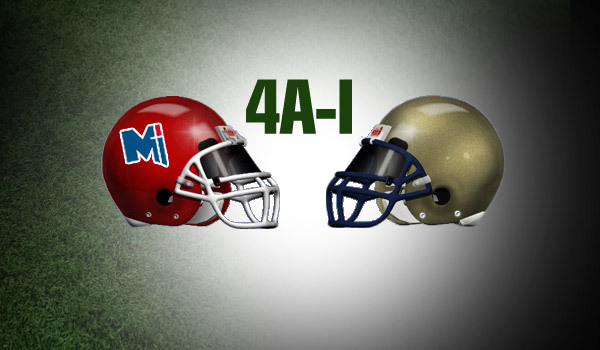 Miege especially opened some eyes with a lopsided win over Blue Valley early in the season. KU commit Ryan Willis leads the Stags at quarterback. He has passed for almost 2,700 yards with 32 touchdowns. Junior Dawson Downing has rushed for more than 1,800 yards and 28 touchdowns. Sophomore receiver Jafar Armstrong has 45 catches for 985 yards and seven touchdowns. Middle linebacker Mark Ogren, who was named EKL Defensive Player of the Year, has 78 tackles and four sacks. The Wildcats aren’t exactly slouches either. Hayden also plays in a 5A and 6A heavy Centennial League, and its only loss came 23-30 to Class 6A’s Manhattan in Week 3. Hayden is led by quarterback Jacob Head, who has completed 128 of 172 passes for 1,780 yards and 28 touchdowns with only five interceptions. He is the cousin of former major league baseball player Jerad Head. Connor Schumacher leads the Wildcats in rushing with 827 yards. Sampson Huston, Cole Meier and Schumacker all have more than 400 yards receiving.